Test your WDM signals with the confidence that results from reliable accuracy. 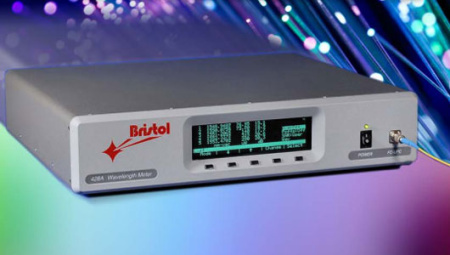 Bristol Instruments provides a family of optical wavelength meters and multi-wavelength meters designed specifically for the testing of WDM lasers and WDM systems. Absolute laser wavelength is measured to an accuracy as high as ± 0.3 pm. This performance is guaranteed by continuous calibration with a built-in wavelength standard and is traceable to NIST standards. Straightforward operation and rugged design satisfy the needs of both the R&D scientist and the manufacturing engineer. In order to fully characterize WDM components and transmission systems, the 428 Series Multi-Wavelength Meter simultaneously measures wavelength, power, and OSNR of up to 1000 discrete optical signals. Wavelength is measured to an accuracy as high as ± 0.3 pm, power is measured to an accuracy of ± 0.5 dB, and OSNR is calculated to greater than 40 dB. In addition, optical spectrum analyzer software is included to generate and display a high-resolution spectrum of the optical signal under test. The 428 Multi-Wavelength Meter combines proven Michelson interferometer-based technology with fast Fourier transform analysis. This results in the ability to measure the wavelength and power of up to 1000 discrete optical signals. Wavelength is measured to an accuracy as high as ± 0.3 pm and power is measured to an accuracy of ± 0.5 dB. In addition, the 428 system automatically calculates OSNR to greater than 40 dB. Two versions of the 428 Multi-Wavelength Meter are available. The model 428A is the most accurate, measuring wavelength to ± 0.3 pm. For less exacting test requirements, the model 428B is a lower-priced alternative with a wavelength accuracy of ± 1.0 pm. The wavelength accuracy of the 428 system is maintained over long periods of time because it is continuously calibrated with a built-in HeNe laser wavelength standard. In order to achieve the highest accuracy, the model 428A uses a single-frequency HeNe laser that is stabilized using a precise balanced longitudinal mode technique. A standard HeNe laser is used as the wavelength reference in the model 428B. The result is a measurement confidence level of 3-sigma. To verify this performance, every 428 system is rigorously tested with laser sources that are traceable to an NIST standard. To provide the most complete analysis of the WDM signal, special Optical Spectrum Analyzer Software is included with the 428 Multi-Wavelength Meter. This software measures the spectrum of the optical input signal to a resolution of better than 10 GHz resulting in the ability to easily discriminate between closely spaced WDM channels. The software operates on a PC running under Windows and data generated by the 428 system is transferred using a USB or Ethernet interface. Operation of the 428 Multi-Wavelength Meter is straightforward. The optical signal enters the model 428 through an FC (UPC or APC) fiber-optic connector on the front panel. The system’s high sensitivity results in an input power requirement of only 0.1 µW (-40 dBm). Automatic electronic gain control instantly adjusts the photodetector signal for optimum performance. The controls of the 428 system are user-friendly and conveniently located on the front panel along with the measurement display. The wavelength, power, and OSNR data can be reported in a variety of formats. Data from a specific optical channel can be displayed, or lists of data from all channels, sorted by wavelength or power, can be displayed. The measurement information can also be sent to a PC using a standard USB or Ethernet interface, or an optional GPIB interface. 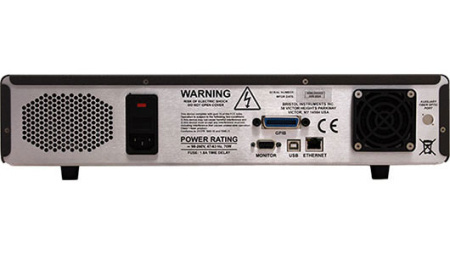 Finally, the 428 system is packaged in a rugged chassis (bench top or rack-mounted) for use in typical laboratory or manufacturing environments.